Ulyatt discusses the early foreign policy errors that the Kennedy administration made, identifying how the failed invasion of Cuba at the Bay of Pigs damaged the president’s reputation and drove Cuban leader, Fidel Castro, into an alliance with the Soviet Union. 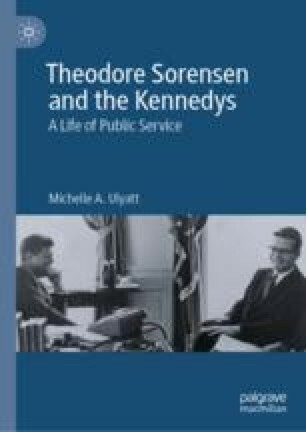 The chapter details how Sorensen influenced the revised foreign policy structures that President Kennedy adopted after the Bay of Pigs and examines the impact that this had during subsequent foreign policy crises. In doing so, the chapter examines President Kennedy’s early approaches on Berlin, Vietnam and relations with the Soviet Union, highlighting Theodore Sorensen’s growing role in shaping the administration’s foreign policy decision-making. Kennedy, John F. 1954. “Remarks of Senator John F. Kennedy on Indochina Before the Senate, Washington, D.C., April 6, 1954.” John F. Kennedy Presidential Library and Museum. https://www.jfklibrary.org/Research/Research-Aids/JFK-Speeches/United-States-Senate-Indochina_19540406.aspx. ———. 1956. “Remarks of Senator John F. Kennedy at the Conference on Vietnam Luncheon in the Hotel Willard, Washington, D.C., June 1, 1956.” John F. Kennedy Presidential Library and Museum. https://www.jfklibrary.org/Research/Research-Aids/JFK-Speeches/Vietnam-Conference-Washington-DC_19560601.aspx. ———. 1957. “Remarks of Senator John F. Kennedy at the Annual Freedom Award to the Hungarian Freedom Fighters in New York City, October 23, 1957.” John F. Kennedy Presidential Library and Museum. https://www.jfklibrary.org/Research/Research-Aids/JFK-Speeches/Hungarian-Freedom-Fighters-Award-NYC_19571023.aspx. ———. 1961. “Radio and Television Report to the American People on the Berlin Crisis, July 25, 1961.” John F. Kennedy Presidential Library and Museum. https://www.jfklibrary.org/Research/Research-Aids/JFK-Speeches/Berlin-Crisis_19610725.aspx. McNamara, Robert S. 1964. Interview by Arthur M. Schlesinger, Jr. John F. Kennedy Presidential Library and Museum, April 4. https://www.jfklibrary.org/Asset-Viewer/Archives/JFKOH-RSM-01.aspx. Warner, Michael. 2008. “The CIA’s Internal Probe of the Bay of Pigs Affair.” Last modified June 27. https://www.cia.gov/library/center-for-the-study-of-intelligence/csi-publications/csi-studies/studies/winter98_99/art08.html.